YHVH wants us to surround and immerse ourselves with His instructions. With obedience to His commands comes great blessings. But we are feeble humans, and if we are not constantly reminded of His Word, we will soon forget. So, we are commanded to post Scripture on the doorposts of our home. And thou shalt love YHVH thy Elohim with all thine heart, and with all thy soul, and with all thy might. I have been Bible journaling, which consists of copying Scripture into a journal everyday. This has been such a tremendous help to me. Not only am I starting my day with Scripture, but I find myself thinking on it more than if I just read it. I have also developed the habit of reading back through my journal and meditating on the verses once again. Simply writing Scripture is a very effective way of “binding His Words on our hands.” Now, let’s talk about a few ways to write Scripture on the doorposts of our house. A mezuzah is a small box containing Scripture inside. 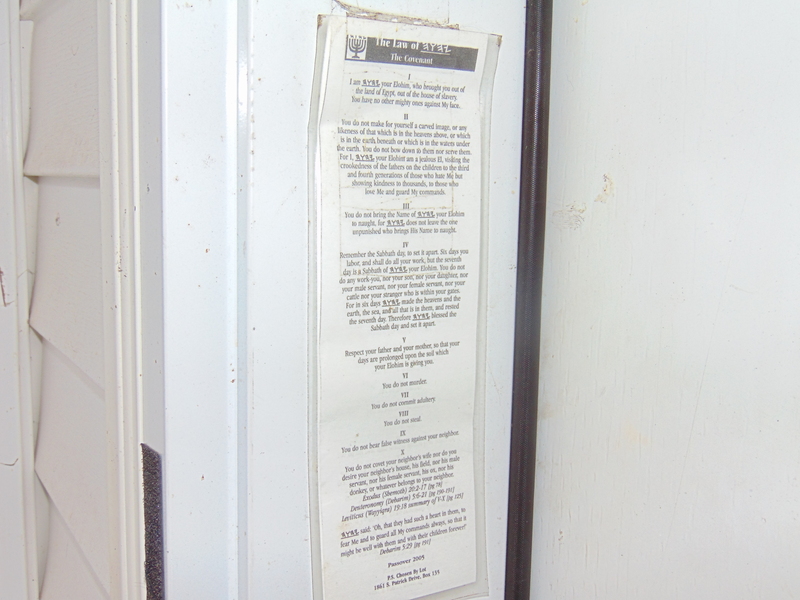 It is usually hung on the doorframe of a Jewish or Torah observant home. It is a great way to identify yourself as a Torah believer, but it doesn’t do a great job at reminding you of Scripture as you walk through the door. My mother came up with a simple and effective way to post Scripture on the doorpost. She gave me a laminated bookmark with the Ten commandments written on it. It has hung outside my front door for several years now. I love my bookmark outside my front door, but I wanted to have Scripture throughout the house as well. The kids and I got together to make some signs to hang on our bedroom doors. 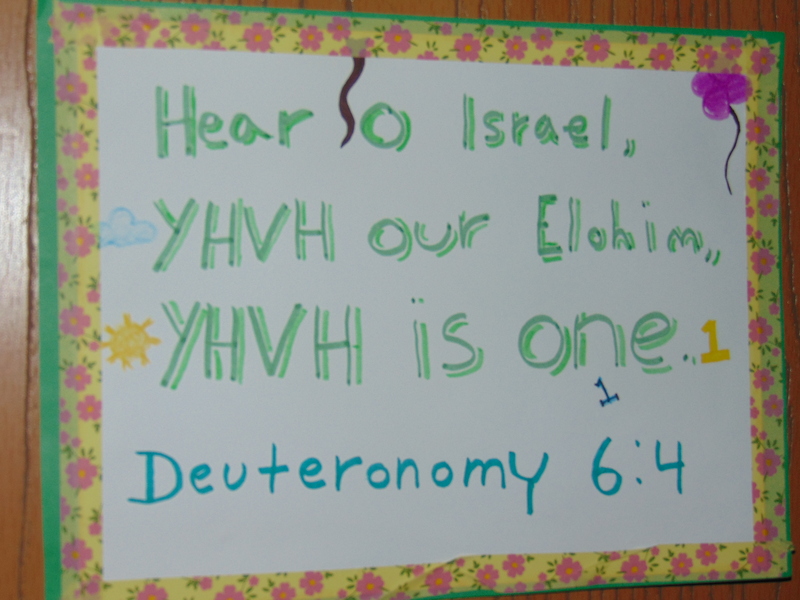 We copied the Shema, found in Deuteronomy 6:4, and decorated it with markers and washi tape. Then we glued our pictures onto construction paper to act as a frame. Washi tape makes a great mounting tape that doesn’t ruin the surface! 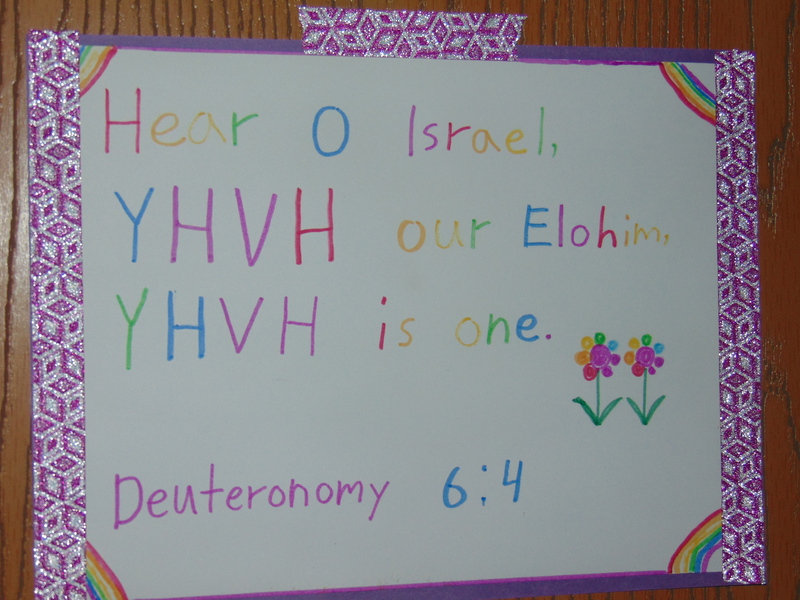 The verses look great on the kids’ bedroom doors. If the pictures come out particularly nice, you may want to frame them. I know of some families that change out a few pictures on the wall every Friday to set the mood in the home for Shabbat. This is on my future to do list. If you would like to put Scripture in your home in a more permanent way, you could consider painting Scripture right on your walls. My sister has an artistic friend that painted verses up by the ceiling where you would normally hang a wallpaper border. It looks amazing! I’m so sorry that I don’t have a pic to give you an idea, but maybe she would be willing to share one with us. Some of you may have done something similar. Please share pics so the rest of us can get inspired! What a lovely way to decorate your home! Some families have also used wall decals. I have never done this personally, but it’s something you can look into. This last idea is one you can implement in less than five minutes. Take an index card or a post it note and copy a Scripture verse on it. Then put it on your bathroom mirror or your computer monitor or another conspicuous place. This is particularly helpful if you are trying to memorize a verse. Remember to read it aloud whenever you see it and you are well on your way to memorizing it. I have really big mirrors in my bathrooms that I sometimes write on with dry erase markers. I did it to help me memorize scripture and it works. I also have a picture frame that looks like an old window. I put scrapbook paper in the frame. One square is for verse of the day/week, one for prayer requests, one for blessings, and one for Torah portion for the week. – Jessica L.
How are you posting Scripture in your home? Do you have a creative method that you would like to share with us? Please share it in the comments! 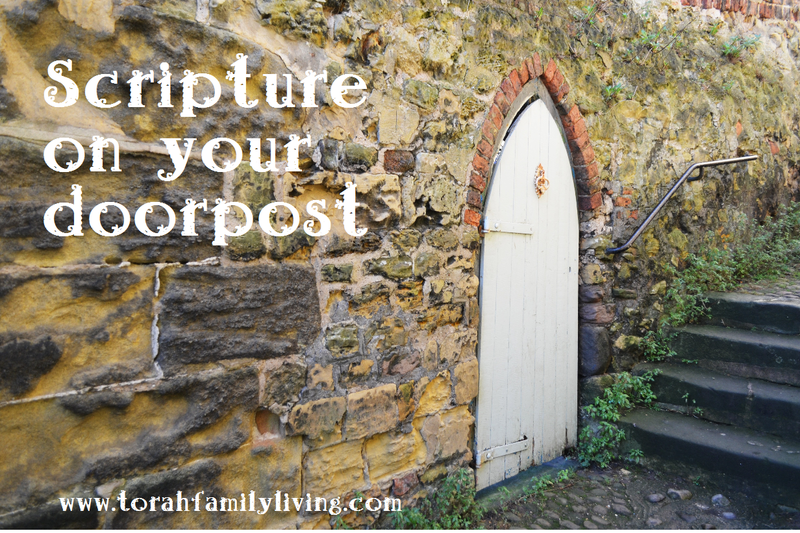 Would you like an easy project to help you post Scripture in your home? 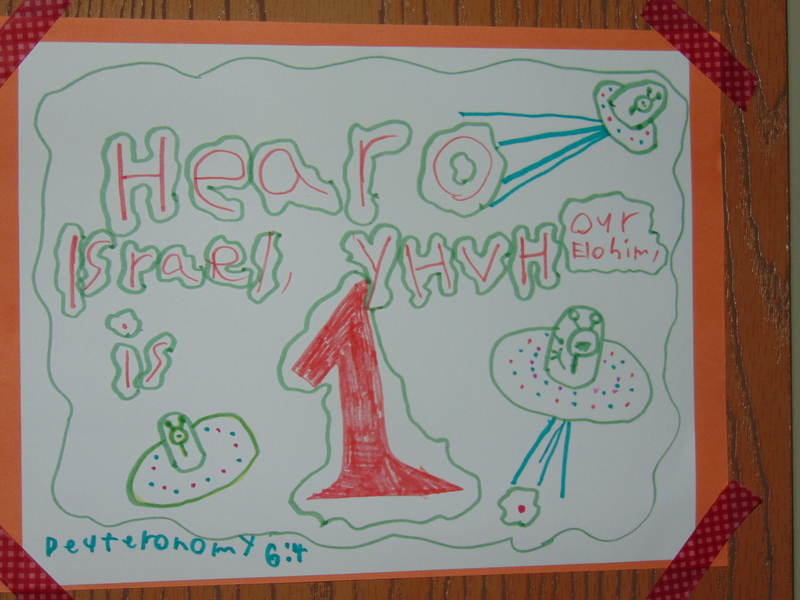 Download our free Shema coloring page when you sign up for our email list below. Thanks and have a peaceful day today! 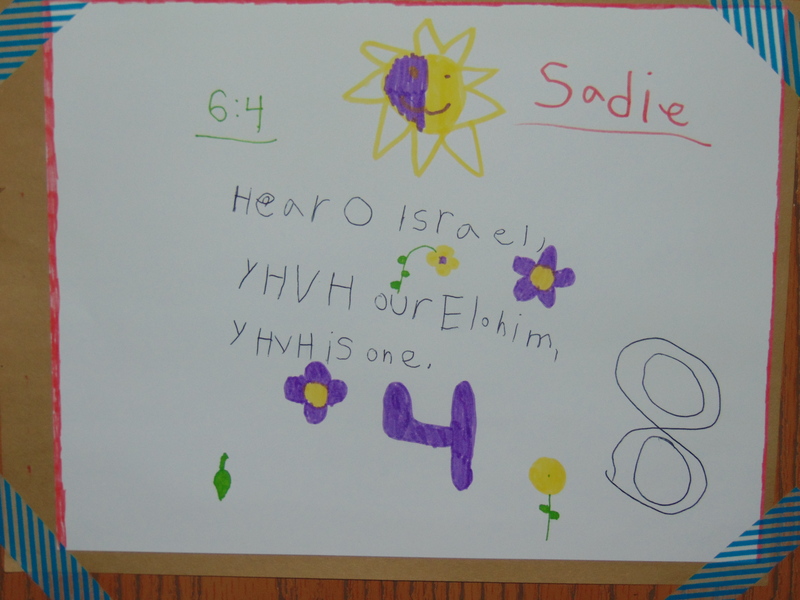 I love your ideas and while I have a mezuzah at each outer door I also like the idea of bearing Scripture throughout my home. Bless you for involving your children; not only does it imprint the Scripture on their hearts but also allows them to show reverence for YWVH and His Word. Thank you for your blog and for the encouragement you bring. Thank you for stopping by, Donna! We had a great time making the signs together. It also gave a great opportunity for discussion on the verse while we decorated. Can’t have too much Scripture! Blessings to you and your family. I have a framed chalkboard in dining area that i change scripture verses weekly. That’s a great idea! Thanks for sharing.